Dead Samsung Data Recovery: How to Restore Data from Dead Samsung? "Samsung Galaxy S6 is dead, it won't turn on and Samsung screen stuck in Samsung logo. There are lots of personal data on my mobile phone, so I want to backup the Samsung data before restoring it to factory settings. Since Samsung Galaxy S6 can't turn on, how can I recover data from dead Samsung phone? How can I backup data from dead or broken Samsung device? Help, please!" In order to avoid losing data, it is right that you need to restore your personal files from your dead or crashed Samsung before trying to fix it by putting it to Recovery mode. However, when your Samsung is dead or crashed, you can not start it in the normal way, so you can't successfully connect your Samsung to computer, enable USB debugging on your broken Samsung phone and export your contacts, photos, videos, text messages and etc. from Samsung to computer for backup as usual. It seems like there is no chance to recover data from dead Samsung. Is it true? No, you can certainly restore files from dead Samsung phone or tablet as long as you have a third-party data recovery tool to help you out. Just read on to get the solutions. How to Avoid Samsung Galaxy Sudden Death? 1. Please always use antivirus on your Samsung phone to protect your phone from viruses. 2. Please regularly make a backup of your Samsung phone in case of data lost or unexpected use. 3. Please don't install applications from untrusted sources. 4. Please regularly update your Samsung phone with the latest firmware. 5. Please replace your battery if it is not working properly. 6. Please don't leave your phone for charging for a long period. 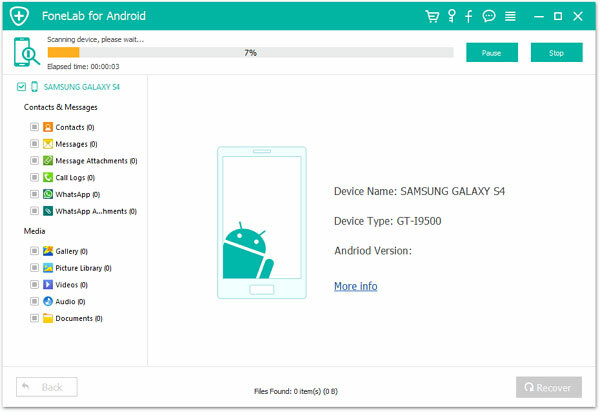 Since it is difficult to directly extract data from dead Samsung phone or tablet in a usual way, you need to rely on a powerful third-party tool to recover data from Samsung devices such as Broken Android Data Extraction. What Can Broken Android Data Extraction Do for You? The Broken Android Data Extraction is a well-known data rescuer for dead or broken Samsung phone, which allows you to freely and selectively restore personal data from your dead/broken/crashed Samsung phones or tablets without enabling USB debugging on broken Samsung devices, including contacts, text messages, message attachments, call history, WhatsApp, WhatsApp attachments, gallery, pictures library, photos, videos, audios, documents and many more. 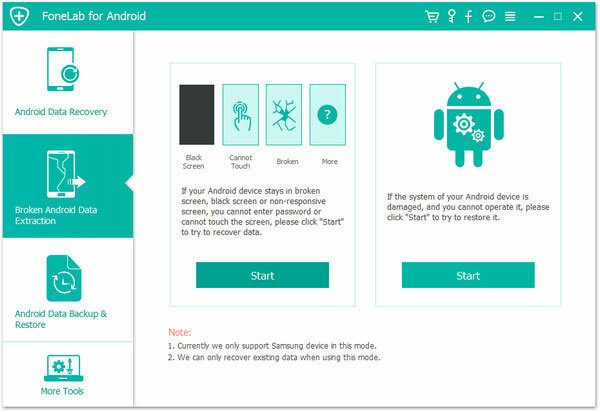 Importantly, it is designed to recover data for broken Android phone, so no matter your Samsung phone gets black screen or broken screen or crashed screen, or Touch screen doesn't respond or any gesture, or you cannot enter password and etc., you can also easily retrieve data from broken Samsung phone or tablet without enabling USB debugging on your broken Samsung device. Also it is fully compatible with almost all Samsung devices, including Samsung Galaxy S6/S5/S4, Samsung Galaxy Note 5/Note 4/Note 3, Samsung Tab Pro and etc. Below are the free trails of the Broken Android Data Extraction, you can freely download the right version of the program on your computer and start to get back your data from dead Samsung. Step 1. Please get a USB cable to connect your dead Samsung device to computer and launch the Broken Android Data Extraction on your computer. Thus the program will automatically detect your dead Samsung without turning on USB debugging on your Samsung phone. On the interface of the program, please click "Broken Android Data Extraction" tab on the left panel. Step 2. 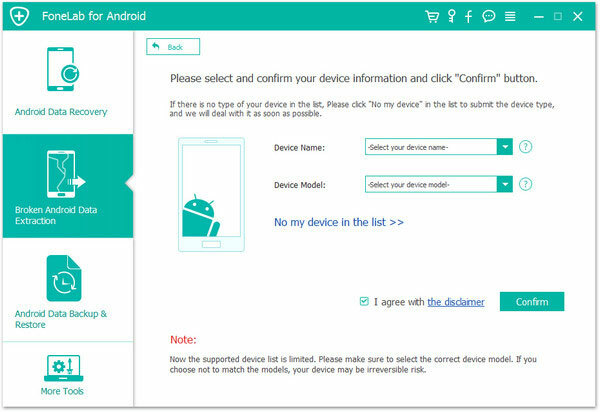 On the next screen, please select the right device name and device model of your dead Samsung from the drop-down menu, then click "Confirm" button to move on. Step 3. Next, you will be asked to put your device into Download mode. 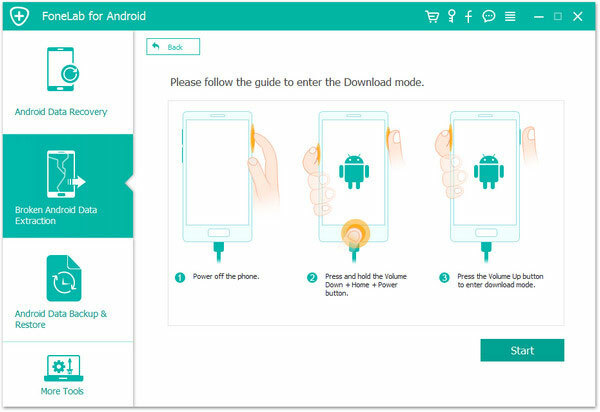 Simply follow the onscreen guide to enter Download mode step by step. After that, just click "Start" button to move on. Step 4. Then the program will start to scan your device for all recoverable files. After quick scanning, you can see all your file types on the left panel, such as contacts and photos and etc. Simply select the file types you want and click "Recover" button to restore Samsung data and save the recovered Samsung data on your computer immediately. Also, you can choose the location where you want to store the recovered Samsung data from your dead Samsung phone or tablet as you like. See, it is so easy to restore data from dead Samsung phone or tablet. Why not have a try with the powerful Broken Android Data Extraction to recover data from broken/dead/crashed Samsung phone right now? Just get back your data. When using Samsung phone or tablet, if it becomes dead/crashed suddenly, or gets stuck in a certain screen like Samsung logo, or it doesn't respond to your command at all when you touch the screen or press the buttons, please try to restart your device. If Samsung phone or tablet has a built-in battery, please press and hold the "Power + Volume Down" buttons at the same time for at least 7 seconds to hard restart it. When Samsung phone screen turns bright, you might release the two buttons simultaneously and the phone should be rebooted automatically and get back to normal. 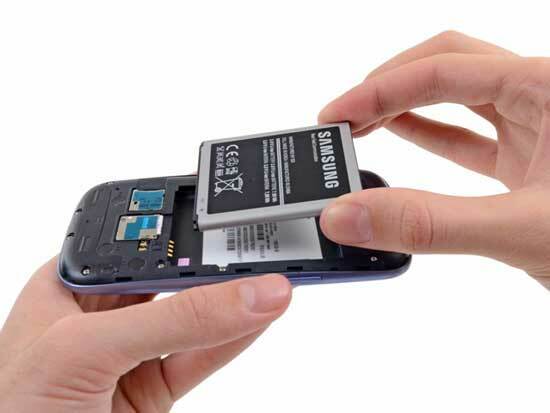 If the battery of your Samsung phone or tablet supports disassembly without built-in battery, please long press the Power button for at least 10 seconds to hard reboot your dead Samsung. If it doesn't work, please take out the battery from your dead Samsung, wait for 2 minutes and then insert the battery into Samsung. After that, turn on your Samsung phone again and your Samsung phone is supposed to be able to operate now. If it fails to reboot, please bring it to Samsung service center to get it checked and fixed. If Samsung phone becomes dead when using a certain application, it should be a signal for users to update version of the software. Please check whether the software has a new available version, if yes, please update the software to get rid of the problem. If it is the software you have downloaded by yourself, there is chance that the downloaded app is not compatible with the other apps on your Samsung phone. It is recommended to uninstall and reinstall the software or download other versions of the software instead. If you have not update your system for a long time, your Samsung phone may get crashed, too. So you can go to Settings > (More) > About device > Software update > Update now. Then your device will start downloading update package and install into your device. Besides, please use Wi-Fi network to download update package to avoid carrier data fee and make sure your Samsung device have enough power (more than 50% battery capacity) and enough device memory (at least 1 GB). And during the upgrade process, please don't disconnect your device to Wi-Fi network or remove battery from your Samsung. 4. After check the software update, software compatibility and system update, if your Samsung device still become dead from time to time, please backup your Samsung data and restore your Samsung to factory settings. 5. If you have tried all above methods to get rid of dead Samsung issue but it doesn't work, please bring your Samsung device along with invoice and warranty card to Samsung service center to fix it. However, before sending it to repair shop, you'd better restore Samsung data from your dead Samsung phone or tablet at first in case of data lost.